The Richmond District is one of San Francisco's largest and most varied neighborhoods. The Richmond District (or Park Presidio as it is officially designated) is located in the northwest quadrant of San Francisco. The district is bounded on three sides by natural features or green space: the Presidio and Lincoln Park to the north, the Pacific Ocean to the west, Golden Gate Park to the south and Arguello Boulevard to the east. This article will concern itself with the core of the historic Richmond, whose boundaries are the same as the Richmond except that the western boundary is Park Presidio Boulevard. The Richmond District is one of San Francisco's largest and most varied neighborhoods. Formerly a predominantly Irish-American area, the district has evolved over the last thirty years into a neighborhood where no ethnic group constitutes a majority, although a sustained influx of Chinese immigrants has given many parts of the neighborhood a heavily Asian influence. Architecturally, the Richmond is almost as varied as its population. Several hundred nineteenth-century cottages, interspersed throughout the district, hint at its rural, agricultural past. Today the Richmond District is a thoroughly urbanized, densely developed neighborhood with commercial corridors along Geary Boulevard and Clement Street, and rows of spec-built Edwardian-era flats and single-family dwellings fanning out toward the Presidio and Golden Gate Park. For most of San Francisco's recorded history, what is now the Richmond District remained in a natural state. When the Spanish first arrived on this isolated peninsula they recorded that the area was a windswept expanse of rolling sand dunes with a sparse covering of chaparral. In June 1846, while the Bear Flag Rebellion was being acted out in Sonoma, the last Mexican governor, Pio Pico, granted Rancho Punta de los Lobos--encompassing what is now the Richmond--to a man named Benito Diaz. Diaz left his lands unimproved, however, and aside from a few hardy squatters, few claims were made on what at that time seemed to be a remote and unattractive area. Lack of interest in the area did not last indefinitely. In 1866 and 1868, respectively, the board of supervisors passed the Clement and Outside Lands Ordinances. These ordinances affected all unsurveyed "outside lands" within the city's corporate boundaries, including the Richmond, Mission and Potrero Districts, among others. The board of supervisors hoped this legislation would facilitate the orderly development of areas within the City's path of expansion. The legislation provided means to settle land claims, and it set aside public lands for parks (including a 999-acre tract which would eventually become Golden Gate Park), schools, fire stations and a city cemetery (now Lincoln Park). In 1870 the "Official Map of the Outside Lands" was published. It extended the grid of downtown San Francisco and the Western Addition into what is now the Richmond. Even before the Richmond was platted and opened for development, its wide open spaces had already attracted a number of ranches and dairy farms. In the 1860s several resident dairymen built the first major road from the City Line to Point Lobos. The Point Lobos and San Francisco Toll Road allowed farmers to transport their products to market downtown and facilitated easy transportation of daytrippers from the built-up portions of the City to Ocean Beach. At the ocean, a seaside holiday economy grew up, with the Cliff House restaurant, hotel and gardens (established in 1863) being the principal attraction. In 1881, Adolph Sutro, the successful engineer, real estate speculator and eventual mayor of San Francisco, purchased the Cliff House and built a railroad to provide access to this attraction, which he soon enhanced with a sculpture garden and his famous Sutro Baths. Meanwhile, he bought up much of the Richmond and became one of the districts major boosters. However, transportation issues needed to be resolved before the Richmond District could become a densely populated residential district as the Committee of Outside Lands intended. Street railway franchises were granted to several different companies in a generally unsystematic fashion, with the primary routes following Geary Boulevard (franchise granted to the Park and Ocean Railroad Company in 1877) and California Street (franchise issued to the California Street Railroad Company in 1878). At first, these lines were operated with horse cars, which were later replaced by steam trains and then electric streetcars in the early 20th century. The growing popularity of Golden Gate Park and the Bay District Race Track in the latter part of the 19th century led to the creation of several cross-district lines running north-south. The next step needed to spur development was the installation of infrastructure. One of the most important tasks was the grading of streets, which in the late 19th century was the responsibility of local landowners. They would apply to the Street Committee of the board of supervisors for permission to grade, pave and macadamize the streets, and once approval was given, they had to pay for the materials and labor themselves. According to an article in the November 1, 1889, edition of the San Francisco Examiner, Geary and Arguello were the first streets in the district to be paved. Finally, potential middle-class buyers of house lots could expect amenities such as water, lights and sewage. Neighborhood improvement clubs were especially crucial to overseeing these improvements. Clubs such as the influential Point Lobos Improvement Club were largely responsible for ensuring that roads were graded and paved, water, gas and sewage lines were installed, and fire protection was put into place. 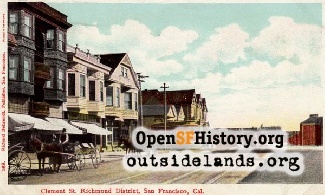 George F. Fletcher, a Point Lobos Club member, is credited with suggesting the name "Richmond" for the district, which up to that time had been referred to as the "Outside Lands" or the "Point Lobos District." Even though the district was now subdivided and accessible, residential development was slow to take off prior to 1906. The existing 19th century development clustered along the principal transportation lines: California Street, Geary Boulevard, Fulton Street (along the northern edge of Golden Gate Park); and several north-south cross streets. Much of the building along these corridors was the result of speculative development undertaken by local builder/developers such as Fernando Nelson and Realtors such as Greenwood and DeWolfe. However, the fortunes of the Richmond District were to take a dramatic turn in 1906. The earthquake and fire of 1906 destroyed most of downtown San Francisco, the South of Market, and parts of the Western Addition and the Mission, driving waves of refugees to open parcels of land at the edge of the city. At first the refugees were housed in small wood-frame "refugee shacks" hastily erected by the City in public parklands. 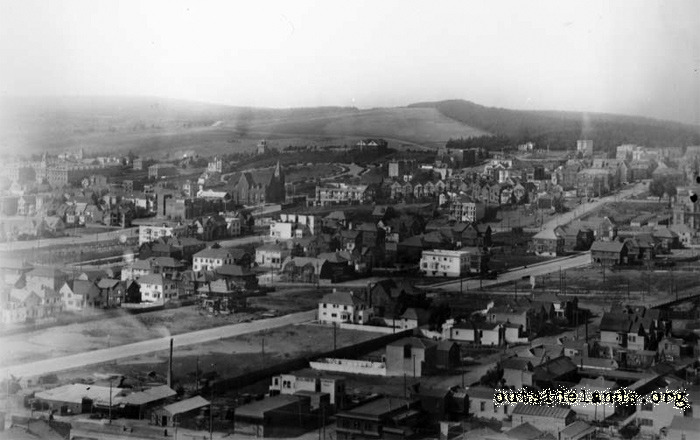 However, as in other districts that experienced an influx of "temporary" earthquake refugees (including the Potrero and Mission districts), many people decided to start afresh and settle in the Richmond. Parcels were subdivided within a few months of the disaster and houses began to pop up all over the district. New residential development occurred at a rapid pace, and the district was largely built out by the late 1920s. The increasing popularity of the automobile minimized the perceived distance between downtown and the Richmond, encouraging more people to build flats and single-family homes, frequently with garages beneath. Geary Boulevard and Clement Street were developed as automobile-scaled commercial corridors in the 1910s and 1920s, and major cultural and religious institutions such as St. John's Presbyterian Church and Temple Emanu-El relocated from downtown and the Western Addition to serve the various ethnic groups now living in the Richmond. Clement Street and Geary Boulevard have always served as the main streets of the Richmond District. The buildings on Clement between Arguello and Sixth Avenue, originally developed between the 1890s and the 1910s, adhere to the typical forms of an outlying urban commercial strip. The majority of these buildings were two-part commercial blocks, with large glazed storefronts in the first floor and offices above. Since the end of the First World War, however, many of the buildings in the district have undergone aesthetic changes, resulting in the reconfiguration of openings and the large-scale removal of original Classical Revival and Mission Revival detailing. Some good examples remain, such as the two-part Classical Revival style building at 15-17 Clement Street. Geary Boulevard developed concurrently with Clement Street, but due to its width it became the principle automobile route between downtown and the Richmond. Consequently, much of the boulevard was redeveloped with automobile-oriented structures in the late 1910s and 1920s. A good example of an auto-related structure is the car dealership located at 3833-55 Geary Boulevard, designed in 1917 by architect William H. Crim and built by the Ruegg Brothers contracting firm. Some early Victorian-era structures still stand; for instance 3815-17 Geary, which was constructed before 1899 when the Richmond was still a largely rural district of dairy farms. Geary Boulevard also attracted several movie houses in the 1910s and 1920s, including the Alexandria Theater at 5400 Geary, designed in the early 1920s by the Reid Brothers. The earliest residential development in the Richmond consisted of farmhouses associated with local dairy establishments. Sited on lots that predate the formal survey of the district, remnants of this rural past survive in isolated cases, often on the rear portion of lots facing Geary Boulevard. As the 1890s progressed, larger rural lots were purchased and developed by merchant builders. Residential development followed two patterns: single-family or two-flat residences built on an individual basis by working-class or middle-class owner-occupants, or rows of nearly identical dwellings built by speculative developers. Blocks developed in the first manner resulted in uneven streetscapes, with residences of varying heights, setbacks and detailing. Blocks developed in the second manner displayed a consistent if repetitive appearance. The development at 654-56 5th Avenue is a great example of the latter pattern, built in 1907 by merchant builder Fernando Nelson as part of a row of six similar dwellings. By the time the Sanborn Fire Insurance map was published in 1913, the characteristic development pattern of the Richmond had crystallized. In general, the principal structure on the lot was sited on the front property line, with the remaining 40% of the lot occupied by gardens, a shed, a garage, or in some cases, a residual windmill or tankhouse. Socially and architecturally, the Richmond District developed in a fashion not anticipated by the Committee of Outside Lands. The Committee thought Fulton Street and its intersecting north-south streets near Golden Gate Park would become the area's prestigious residential blocks, but what actually came to pass was slightly different. The fashionable Presidio Heights neighborhood in the Western Addition had spread westward as far as Arguello Boulevard, and due to good transportation along California Street, upscale development continued to spread undeterred into the northeastern corner of the Richmond. Presidio Terrace, located just north of Temple Emanu-El on Arguello Boulevard, was the most extravagant residential enclave constructed in the Richmond. Developed by the firm of Baldwin & Howell beginning in 1905, this "residential park" was comprised of forty buildable lots. Most of the houses comprising Presidio Terrace were designed by prestigious San Francisco architectural firms such as MacDonald & Applegarth, Charles Whittlesey, Bakewell & Brown, and Hyman & Appleton. Designed in a variety of styles, including Tudor Revival, Mission Revival, Craftsman and Classical Revival, most of the houses were built between 1905 and 1910. Number 30 Presidio Terrace, designed in 1909 by MacDonald & Applegarth, is a good example of a Tudor Revival dwelling in Presidio Terrace. The lots on Fulton Street facing Golden Gate Park and the intersecting avenues near the park were considered valuable sites for single-family dwellings during the 1910s and 1920s. Companies such as Allen & Company built small tracts of Mediterranean, Secessionist, Arts and Crafts and Mission Revival dwellings. Moving north toward Geary Boulevard, mid-block multiple-family flats predominate, with large apartment buildings located on the corners. In general, the flats are scarcely different from the single-family dwellings, except that there are usually two entrances. Most are large buildings with two floors (each containing a single flat) and a garage below. Number 766 5th Avenue, designed and built in 1914 by Jensen & Hooper Contractors, is a good example of a speculative dwelling in this section of the Richmond. 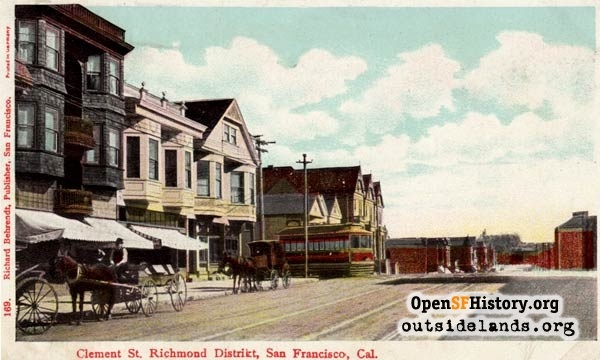 By the late 1920s the Richmond District was largely built out as the last remaining infill lots were developed, and the neighborhood became one of San Francisco's "most urban suburban neighborhoods." The district remained largely unchanged until the 1960s, when it began to experience an influx of immigrants from China and Russia. During the 1960s and 1970s the Richmond was one of the few neighborhoods in San Francisco to gain population. Although this added to the neighborhood's vitality, it also resulted in the demolition of many historic buildings as higher population densities led to the replacement of small cottages and bungalows with larger 3-family "Richmond Specials." This trend continues today as Victorian cottages and flats make way for roomier but frequently aesthetically challenged and out-of-character multiple-family dwellings. In recent years, however, appreciation for the district's historic architecture has grown, along with an awareness that much of the neighborhood's past is worth preserving.